In the summer of 2008, I spent ten days with a dear friend in eastern Idaho and western Wyoming. We went to Yellowstone, I fell in love with Jackson Hole, and I also had the ride of a lifetime in Teton Canyon on a big mule named Sara. I rode Sara a couple times while I was there, and she instantly found a place in my heart and I knew I could never forget her. Sara and I really clicked, and she's pretty darn special to me. Like so many other people, Sara's owner has fallen on the hardest of hard times, and facing his own uncertain future has to sell Sara. I would buy her in a heartbeat if I could. I'm totally bawling writing this, this breaks my heart. I can't take on another big 4-legged animal now, it's impossible for me. It just kills me that Sara faces an uncertain future too, and I want to see her go to a good home. I wish that could be with me, or with someone I know. I would trade incredibly large amounts of art to make that happen. If anyone out there can provide a home for Sara please contact me. Please please please. I love that mule. This hurts me. I'll do just about anything to help her get a new home, but I don't have money to spare. She's about 18 years old I think, in excellent health, 16 hands tall, is 100% awesome, and very reasonably priced. And she has a full set of tack. She lives near Jackson, WY. I wish I could help. But I can't. 3. Even if I could, I certainly don't have to room. I wish you all the luck. I do hope y'all find her a good home. 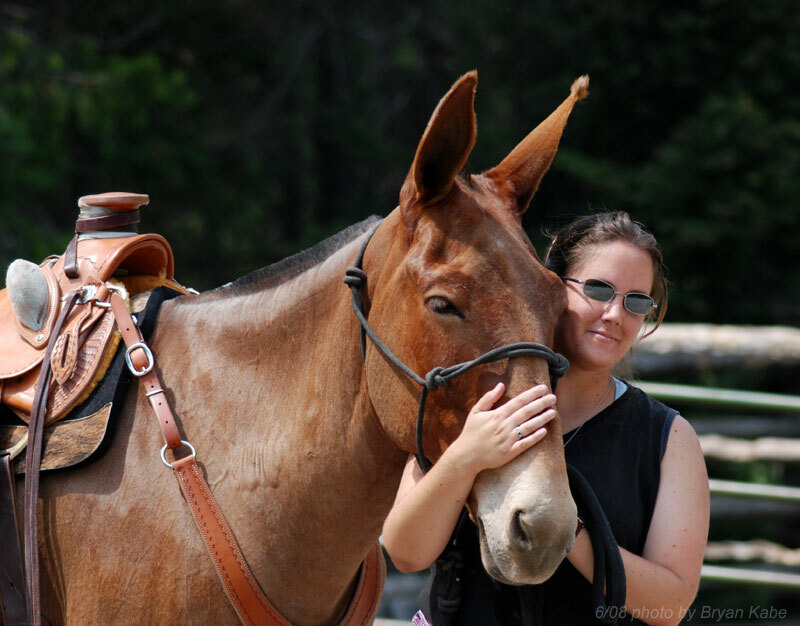 Sara would probably make a great companion for my mule Pete. However, I am in California and could not get her to California even if I could afford her. I like mules. Heck I have been called a mule! I think that a lack of fencing and a long drive to DE would preclude her residence at my home, but she would be cool to ride to work every day! Talk about going green! -BMc. Oh I wish I could help. But I'm in England! And I've never seen a real live mule - - - but she looks gorgeous. OMG she is beautiful. Nice to meet you. We are actually looking for a mule right now but Jackson Hole, Wy to Grand Lake, Ok is a bit far to transport an animal. I sure hope you find a good home.